So yeah. I've been writing a short Naruto story over the last little while, since writing based around that anime is extremely easy in my opinion. So yeah. These are all original characters for the most part, except for skills and overall Naruto based things. I'll post the profiles for the two main characters, Jinn and Kumo, here before posting the first two chapters of the story as well as the back story for them. Those two are the only constant characters I'll use, unless a character of importance shows up. I'll update the second post as I complete each chapter. Personality: An simple and easy-going person that is dedicated to his task and his way of the ninja. Cheerful, Sometimes goofy, and protective of his friends and family, Jinn is a skilled ninja. History: Jinn is one of two Identical Twins. The weaker of the two, Jinn has still pushed himself to keep up with is brother, Hitomu, who has amazing strength and intelligence. At the age of 18, Hitomu left the Village of Konoha to search for his 'destiny'. Jinn tried to stop his brother from leaving the village, and a small fight ensued where Hitomu was forced to knock Jinn unconcious with a small burst of chakrato the forehead. Since that day, Jinn continues to train to defeat his brother and draghim home. Bloodline: Byakugan - A full 360 degree vision, and ability to look further into the distance and through objects. Jyuuken - Meaning "Soft Palm". With the ability to release chakra through any point in their bodies, the Jyuuken fighting style releases chakra through the palms and fingers to do internal damage to the opponent. Specially Made Explosive Kunai - A golden colored kunai with a special explosive summoning tag attached. When the kunai explodes, it instantly summons and launches 5 normal explosive note kunai's in 5 random directions. Battle style: Specialist with close range battle, and prefers to use wind style jutsus. Summons: Galestorm Falcon "Mazomaru" - A enormous bird that has powerful control over the elements. Jinn rarely uses this summon in battle, as Jinn perfers to handle things with his own hands. Personality: Relatively calm and quiet around most people, and even somewhat shy. But when she's with friends, she's loud, hyper, and happy. It takes quite a bit to earn her trust, but she will protect the ones who have it with her life. The same goes for respect; very few ever earn it, but it's worth it. The words 'sir', ma'am', etc, don't exist in her vocabulary otherwise. Finally, she absolutely loves to fight, and will rarely refuse a challenge, especially from Jinn. History: Born in the Village of Sand, she was orphaned at a young age and soon after was forced to leave her home, and her sister, to live in the Leaf Village. At first, she blamed Konoha for the death of her parents, and hated everyone there. But after meeting with Jinn and fighting with him, she started to see that she was wrong. After seeing her sister, Rei, again during the war, she wants nothing more than to find her again and convince her to return home. Bloodline: Unknown. The Shingetsu Clan was known for copying several unique bloodline techniques, however. Summons: Avior, an oversized red and white lion with power over fire. Other: Wants nothing more than to defeat Jinn at something! Jinn and Kumo first met when Kumo's Kitsune mask was accidently taken by a very young and scared girl. At the time, Kumo didn't like any Konoha ninja. Probably still doesn't except for a select few. So Kumo chased after the little rascal with an intent to kill in order to get her Kitsume Mask back, using her well mastered Kaze no Yaiba in the process. The girl came across Jinn who was patrolling the village near Ichiraku Ramen, and noticing the rather angry and dangerous ninja chasing her, went straight into a defensive position to protect the girl. After quickly dispatching Kumo with some quickly placed Hyuuga Style Taijutsu, easily cancelling the chakra in both her arms temporarily. Kumo then fled. The next time Jinn and Kumo saw each other, they were being forced to work together. The Village of Suna was attacked by a powerful, unknown force of Ninjas, and under the current situation. Gaara, the Kazekage of Sunakagure, ordered all ninjas and civilians to flee to Konoha. When they arrived, Tsunade, the Hokage of Konohakagure immediately knew how serious the power of the invading army was if Suna was forced to withdraw. While gathering the for a joint counter attack of both Suna and Konoha's strongest Ninjas, Gaara and Tsunade decided to send a two man team into Suna and begin information gathering. This is when Jinn and Kumo began their first mission as a team. Neither Kumo nor Jinn made it into Suna together easily, as they were attacked by many ninjas on their path to the village, resorting to flight in order to get into the village in the end. They did not last long in the village with their pressense revealed and all ninjas searching for them. Instead of being killed on the spot, they were poisioned and knocked out by a team of medical ninjas who were the ones to find them. When they awoke, they were behind jailcell bars in an unknown part of Suna. Well, at least it was unknown to Jinn, where as Kumo knew exactly where she was. They were greeted by a mysterious guard, who was soon to be revealed as Jinn's twin brother, Hitomu. Hitomu told Jinn and Kumo that he was the one that led the attack on Suna, as he had prior knowledge of the layout of the land. Hitomu then left, leaving Jinn and Kumo to escape from the prison by blowing a hole in the wall opposite the bars. Jumping out of the prison building, they landed in front of Hitomu and his partner for this mission, Avian. A bulk of a man. Hitomu knew Jinn and Kumo would waste no time in escaping and waited for the opportunity to attack. Jinn, wanting to beat the crap out of his dear brother for leaving Konoha and becoming a Missing-Nin, left Kumo to fight with Avian. Jinn did not stand much of a chance against his brother, who was greatly superior in battle. The same was for Kumo, who was overpowered in the end by the massive strength of Avian. In a unknown burst of strength and power radiating from Jinn when he saw Kumo about to be defeated, Jinn moved with amazing speed and stopped Avian in mid punch, where Kumo quickly took the chance and lobbed off Avian's head in one swift swing of her Kaze no Yaiba. Hitomu fled the village when word of the joint counter attack reached his ears, and medical ninjas arrived to provide aid to any injured ninjas just as Jinn pasted out from his injuries from his battle with Hitomu, and his chakra exhaustion from the strange burst of power. 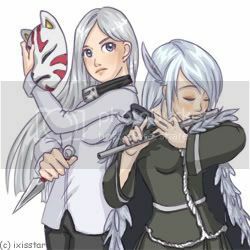 After the success counter attack to reclaim Sunakagure, Jinn and Kumo, as a show of friendship between Konoha and Suna, were made a 2 person team permanently. Jinn and Kumo went on many missions after the takeover of Suna, and a month passed before they heard from Hitomu again. This time, the mysterious ninjas that attacked and took over the Village of Suna, was now targetting Konoha. Instead of just attacking, they waited outside the village, with Hitomu standing in front of them all. Jinn knew he was calling him, and took off at Tsunade's command to defend the village. With the help of Kumo and his summon, Jinn was able to easily take down a large portion of the army, and the two ninjas yet again stood before Hitomu. Hitomu had a new partner this time. Someone, who had prior knowledge of Kumo. Before Kumo could get an answer on who she was, they fight began against Hitomu. The fight was a large power struggle, where Hitomu would attack and Jinn and Kumo would try and force it back to counter, only for the counter to be turned against them. They managed to hold out for quite awhile until Hitomu grew tired of the fight with them, and began to attack with his strongest Jutsus. Before a severely powerful Water Dragon struck Jinn and Kumo, the mysterious partner that came with Hitomu froze the Water Dragon in mid air, claiming that Hitomu was told not to harm Kumo. She finally explained that she was Kumo's sister. She has been travelling with Hitomu when she learned that he had encountered her sister. No more information was given as Hitomu and Rei left the battlefield, leaving Jinn and Kumo to limp back to the village. The story continues the next day, where Jinn and Kumo are still recovering from their battle. Kumo was sent back to her home in Suna to relax for a few days before resuming with her missions with Jinn. Jinn, already in Konoha, instead went into training. What they didn't know, was their two person team was about to get a new member, in light of their lack of power in their recent battle. To know more about the main characters, please view their personal profiles in the post above. Jinn hung upside down, sticking his head inside the doorway where Kumo lived, nearly scaring the socks off her. Grinning widely, Jinn swung around and landed gently. "You jump too easy." said Jinn happily, just as Kumo planted her foot on his face, knocking him to the ground. "You fall too easily." stated Kumo, before walking off towards the exit to Suna. "So, what's on the agenda today?" said Jinn, jogging to catch up with Kumo and quickly falling in step beside her. "Nothing special. We just have to take a merchant from the Land of Waves back home. He has a small shop here, but he needs to return for more products to sell. Should be boring." said Kumo, as he slid her mask onto her face. "What does he sell?" said Jinn quickly, not knowing much about Suna. Kumo looked over at Jinn, talking to him through her Kitsune Mask. "He sells weapons. Good ones at that." said Kumo. Jinn nodded lightly in responce. "Ninjas need good weapons." stated Jinn as he pulled out a gold kunai from his side pouch. This kunai was special to Jinn. He and his twin brother Hitomu had developed this special kunai together when they were growing up, and over time mastered the process in making them. 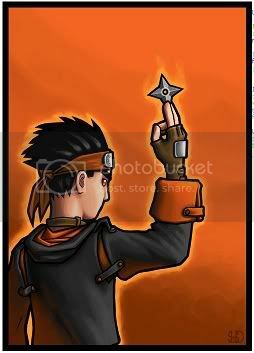 It was a unique kunai that only Jinn and Hitomu used, so it was great for catching people off guard in battle. Putting the kunai away, Jinn smiled. "Well, where are we supposed to meet this merchant?" asked Jinn, as his Byakugan activated suddenly, and he watched the surrounded areas as they walked. "He should be waiting for us near the entrance. It won't be that long of a trip, as we are going by carriage." said Kumo. It wasn't long before they reached the entrance where, as Kumo had said previously, the Merchant was waiting quite patiently for them to arrive. "Thank you for taking on this mission." said the Merchant as he bowed to them in thanks. Jinn smiled happily. "It's our pleasure, and our job." said Jinn happily. "I'm Jinn Remona, a Jonin from the Hidden Leaf Village and..." Kumo continued the introduction from where Jinn left off, "...I'm Kumo Shingetsu. Chuunin Rank Ninja. Sand Village." said Kumo happily. "Nice to meet the both of you. Shall we be off towards the Land of Waves?" The merchant said quickly as he walked just outside the village where the carriage awaited to take them towards the Land of Waves. Almost three days of nothing but walking and riding passed as they slowly traveled along the main roads. It wasn't until the entered the Land of Waves, and were passing by the first of many bodies of water while riding along the side of a large cliff, when the temperature of the air suddenly dropped drastically. Already sitting on top of the carriage, looking out at the water and it quickly began to freeze over. "I hate the cold!" screamed a familiar voice from inside the carriage, and Kumo's head popped out the window. "You live in a desert. Obviously you hate the cold." said Jinn amusingly, and looked back at the body of water. "Hyoton: Roga Nadare no Jutsu!" Turning around quickly at the sound of the unknown voice, Jinn watched a avalanche rushed down the cliffside towards them, being led by three wolves made up entirely of ice and snow. Jinn quickly retreated away from the carriage, just as Kumo came bursting through the carriage door carrying the merchant. The carriage was instantly destroyed when the avalanche hit it, sending splinters of wood flying in all directions. Landing on the now frozen lake beside Kumo, Jinn looked around, trying to use his Byakugan to see who used that Jutsu. "Keep on your toes. We're not alone." said Jinn as Kumo looked around, preparing to react to anything that came their way. With no reason to react, two Ninjas appeared from under the ice just in front of them. Grinning at Jinn and Kumo, and male stepped forward. "I figured for sure we would have gotten them with the avalanche, eh Sis?" said the mysterious man who stood in front of a slightly shorter young woman, who was surprisingly standing in rather thin clothing dispite the low temperatures. Jinn looked over at the merchant just as Kumo helped him to his feet. "Get off the Ice. It's probably not safe here for anyone who can't defend themselves." The merchant nodded and slowly walked and slid across the ice towards solid ground. "Hey. Don't ignore us." said the female as she placed her hands on her hips and glared at Jinn. Standing in a short tight red t-shirt, and black shorts, the female looked over at her brother. "This guy is disrespectful." said the woman. "Natalia. Calm down." said the male softly. "But Souji..." started Natalia before Souji glared at her and she piped down. Looking up at Jinn, Souji grinned. "We're after that merchant. Step aside, and we won't be forced to kill you." said Souji sternly, getting straight to the point. Kumo grinned as she gripped a kunai in her hands. "You couldn't kill us if you tried. Right, Jinn?" said Kumo cheerfully, happy to not be sitting around bored anymore. "You said it, Kumo." said Jinn as he crossed his arms in front of his chest. "Very well. Shall we be starting then?" said Souji as he and Natalia slowly rose an inch off the ground, and looking down, Jinn noticed they both had formed ice skates out of the ice below them. "Ice ninjas. Great..." said Jinn calmly, taking a few steps back, Kumo following beside him. "Let's go, Sis!" said Souji as he dashed at Jinn and Kumo, Natalia following extremely fast behind her brother. Jinn's eyes opened wide at the sudden speed both of them shot into as they rushed towards them. Having his Byakugan previously activated, Jinn watched them both as closely as he could, but his concentration was being split in three, as he was also trying to look out for Kumo as well. Kumo stood with her back almost entirely against Jinn's, as she looked around at the blurs she knew were her enemies. "Ya know. This is like when you try to run in circles around me at high speeds." said Kumo calmly, as she slid her kunai back into her waist pouch and pulled out four small homemade grenades. "Yeah. You should know of some interesting ways to slow them down." said Jinn. Kumo nodded in agreement, as she activated the chakra switchs within the grenades, and tossed them in each of the four compass directions. Jinn watched the grenade she tossed over fly past the left side of his head, and bounce forward across the ice, coming to a stop a few feet away from them. "Jump?" said Jinn stupidly, already knowing the answer to the question just as Souji and Natalia came into view on beside them a short distance, making nearly the same hands signs together. Souji and Natalia screamed the same words just as Jinn and Kumo prepared to jump out of the way of their attacks, only seconds before the grenades were set to explode. "Hyoton: Tsubame Fubuki!" Using their high agility, both Souji and Natalia began throwing very thin objects towards Jinn and Kumo, which quickly took the shape of small swallows, quickly changing directions to follow Jinn and Kumo as they launched themselves into the air. Moments after leaving the ice, the grenades that Kumo had tossed seconds before, finally exploded, shattering the ice in those four places and sending heat and fire in all directions, engulfing Souji and Natalia, who at that moment, seemed uninterested in the grenades. Looking down at the incoming attacks from below, both Kumo and Jinn began making different hand signs, preparing to defend and attack at the same time. "Katon: Goukakyuu no Jutsu!" yelled Kumo as he shot a rather large ball of fire towards the incoming barrage of ice swallows, just as Jinn thrust one of his palms towards them as well, "Fuuton: Kami Oroshi!" blasting a tornado like wind into the fire, and together created a giant burning funnel that Jinn and Kumo called Hell's Inferno. The ice swallows were easily engulfed and burned away by the fire, and as Kumo and Jinn fell back to the water, the landed upon it, standing above the water with precise chakra control. "That was too easy." said Kumo calmly. Jinn did not respond to this statement, as he was scanning the entire area as best he could with his Byakugan, trying to find where Souji and Natalia disappeared to. You can all comment from here in. I'll just edit the second post with more chapters.